After such a long winter, it's hard to believe it's actually spring. But April is here and the warmer weather is on it's way. Here is my Must Have list for April. 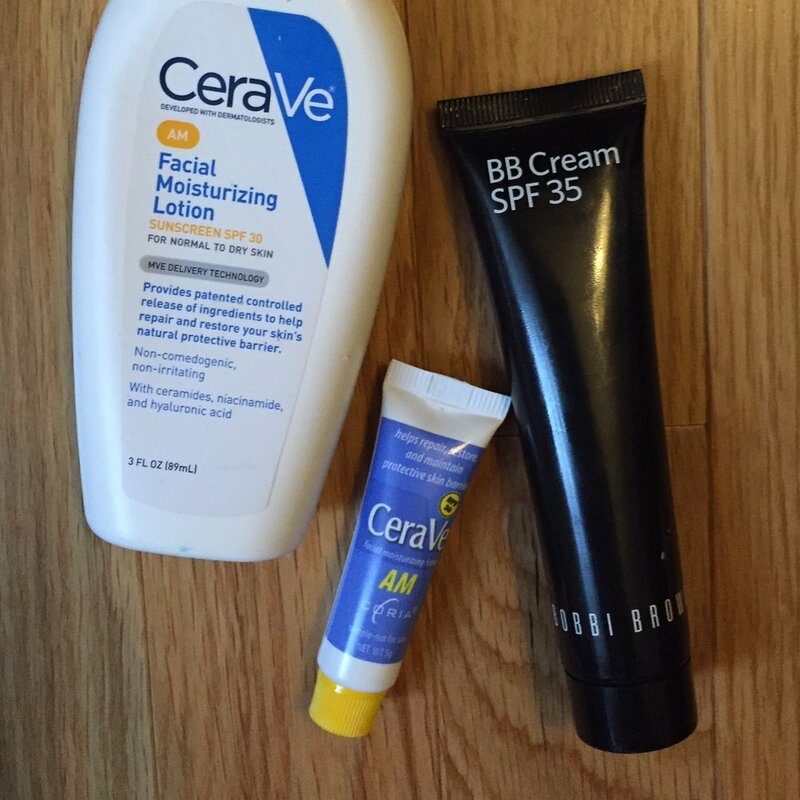 Moisturizer and makeup with SPF- I use sunscreen products daily all year long, but with the longer days and warmer weather I'm outside more, so it's even more important to get into the habit now. My first layer is a moisturizer with sunscreen- I like CeraVe AM. I used to really love the oil free version of Bobbi Brown's SPF 15 tinted moisturizer but they discontinued the formula, although the regular version is still pretty good. Instead I've been using the BB Cream SPF 35- I like that it has a higher SPF and slightly more coverage while still being lightweight. A Trench Coat- April showers require a lightweight rain coat, like my classic Burberry trench, which is also my most prized possession. It can dress up jeans and sneakers, and is a perfect cover up for a dressy night on the town. There are great trench coats out there at all price points, including this cute one from Banana Republic. TRX- So only nine weeks until summer, AKA bathing suit season, so it's time for me to step up my workout schedule. I started doing TRX with my trainer, Trish, from Method 360. Three years later I still love it and I swear it's the most effective and least boring way to stay strong. I got my very own for a birthday gift this year, and although I prefer the classes at M360, it's easy and convenient to get in a session at home if I have to. A Baseball Cap- My worn and faded Yankee cap used to be a casual staple for me in my twenties, but in an effort to be taken more seriously, I packed it away. But I'm bringing it back this spring! At this point in my life I've already proven myself, and I don't really want to take myself- or life- too seriously anyway! What are your April Must Haves? Share in the comments below. Signs of spring are out there, but it still feels like winter in my small town so my March Must Haves help me ease the transition to the warmer weather. A classic pair of Converse- A warm weather staple in my closet for years, I pull my two pairs- white low tops and black high tops- out of storage once the snow starts to melt. It’s a fun and casual spring look for when your toes aren’t quite sandal ready! A great pair of shades- I love sunglasses! I’m not big into accessories but this is one I can’t get enough of. Right now I am rotating two- both Burberry. I prefer the frames to be in a light tone that works with my skin and hair color. Aviators are still hot and I predict colorful frames will be big for the summer. Layers- It’s cold when you leave the house, warms up during the day, and chills down in the evening. The only way to look good with these ups and downs is to dress in layers. My favorite spring look incorporates a t-shirt under a jacket or blazer with a large lightweight scarf which can be removed as the day warms up. You’ll see me wearing the Azul Infinity Scarf from Noonday Collection that I can’t wait to pair with my new Regent linen blazer from J.Crew. Pair with skinny jeans that hit at the ankle bone and a cute pair of flats and you’re ready for anything Mother Nature throws at you. Bronzer- See that woman at the grocery store with a tan in March? Unless she just spent spring break in the Bahamas, it’s not real! But when we start to cover up less as the temps warm up, our pasty winter skin makes us want to shrink away. Add a little bronzer to your makeup routine. Apply to the areas the sun would naturally kiss- temples, nose, cheekbones and chin. My favorites are both Bobbi Brown- Bronzing Powder ($40) and Brightening Finishing Powder in Bronze Glow ($52). Catalogs, catalogs, catalogs- It’s time to start thinking about your spring wardrobe! When you live in a small town like me, you might not have a lot of shopping options. That’s what catalogs are for! I always look forward to getting my J. Crew Style Guide in the mail. I rip out the looks I love and put them on my inspiration board. Let the spring style planning begin!! My small town happens to be in the Northeast, so my February Must Haves are definitely needed in a cold, snowy climate. Creamy nighttime moisturizer- the best is CeraVe® Moisturizing Cream. It is ideal for drier areas of the body including elbows, knees and heels and can also be used on the face as it’s noncomedogenic (does not cause pimples or acne by clogging pores), non-irritating and fragrance-free. Workout pants that keep you warm and cozy- I purchased mine several years ago at Lululemon in Boston and I’m never disappointed. The inside legging keeps me warm and the outside layer is windproof and adorably casual yet chic so I can run errands after my workout and still look good. The closest version to the ones I have are probably the Studio Pant II Lined. Several tubes and tubs of Aquaphor Healing Ointment- Available at all drugstores in both the skincare and baby aisles, this multi-purpose product will be a purchase you will not regret. I use it for chapped lips, dry and itchy skin, on cuts, to smooth flyaway hair, and if you have a baby, apply liberally after every diaper change. I keep a tub in every bathroom and small tubes in my car, office and purse. My instinct on a cold and snowy day is to stay in my pjs, bake cookies, thrown on a rom-com film and veg out on the couch with an issue of Vogue and the fireplace roaring- sound nice? That’s why my winter Must Have includes a motivating and inspiring trainer/gym and keeping things interesting. That's why I've got a few differently places I am currenlty sweating at. Orange Theory is my go-to now for a killer workout with tons of sweat and a heart monitor that tracks my training so I can't cheat myself. Sophie at Syracuse Yoga gives me the mind-body connection I crave, allowing me to quiet my mind, strengthen my body and push myself in my yoga practice. I've been doing Barre 3 with owner Jen Rubin for about two years and so I am super excited her studio is finally opening this weekend in Dewitt. I describe it as a combination of strength, barre and yoga- the philosophy is to give your body what it needs and to accept that it will change every day. Classes are free this weekend and you can find out more information at their website. * Some content has been updated as of 1/31/18.